After P. H. G. Powell-Cotton and G. F. Pinfold, 1939, Plate IV. Today’s image for Day 313 of the VM_365 shows half of a Roman pottery bowl found in one of the pits excavated and recorded by James Beck and Antoinette Powell-Cotton at Minnis Bay, Birchington in 1938. The bowl, described as a half of a red ware colour coated dish, was found in the same pit as the double handled wine jug featured in yesterday’s post for Day 312 of the VM_365 project. Half of a 4th century black pottery vessel, fragments of millstones and part of an upper quern stone were also found in the pit. After P. H. G. Powell-Cotton and G. F. Pinfold, 1939, Plate III. 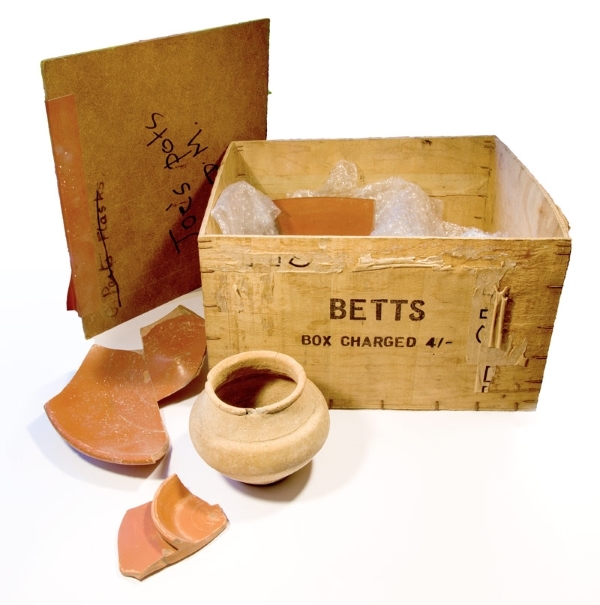 Today’s image for Day 312 of the VM_365 project shows three Roman pottery vessels found and excavated by James Beck and Antoinette Powell-Cotton in pits on the foreshore of Minnis Bay, Birchington in 1938. 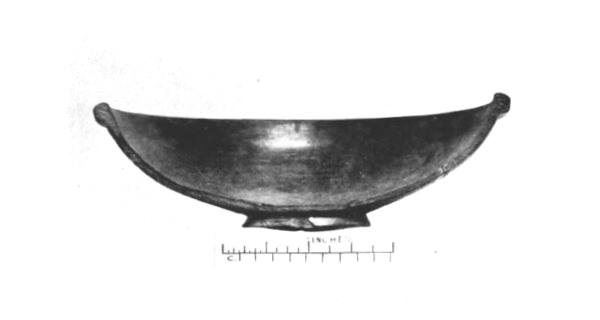 The vessel on the left hand side of the image was found in a square shaped pit and is described as a ‘grey Belgic vase’ by Major Powell-Cotton and G. F. Pinfold in their report and catalogue of the site in 1939. This late Iron Age/Early Roman vessel was found along with the base of a 1st century rough cast pottery beaker and a fragment of Quern stone. 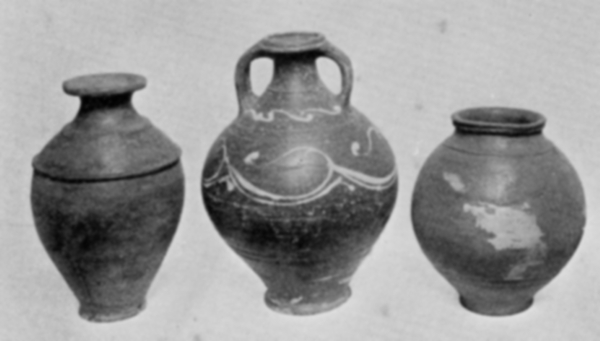 The vessel shown in the centre of the picture is described as a two handled wine jar of New Forest type. A wide range of wheel thrown fine wares were produced in the New Forest in the 3rd and 4th century, sometimes decorated as is the case with this vessel, and are generally found distributed across southern Britain. The vessel was found complete, in a pit along with some other pottery and a fragment of the upper part of a quernstone. The vessel on the right was found in a pit beneath the millstone that featured in yesterday’s, Day 311 post for VM_365. 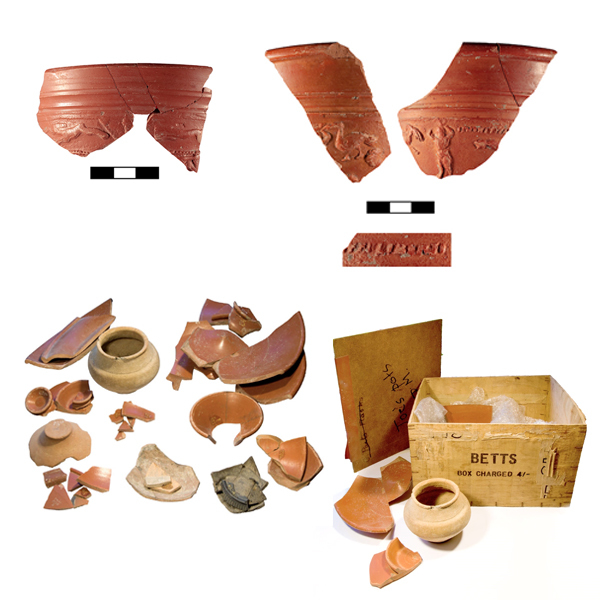 The vessel was described as a fine red ware pot with the remains of decoration with white slip. Some of the pits may be the remains of the bottoms of well as three contained springs. 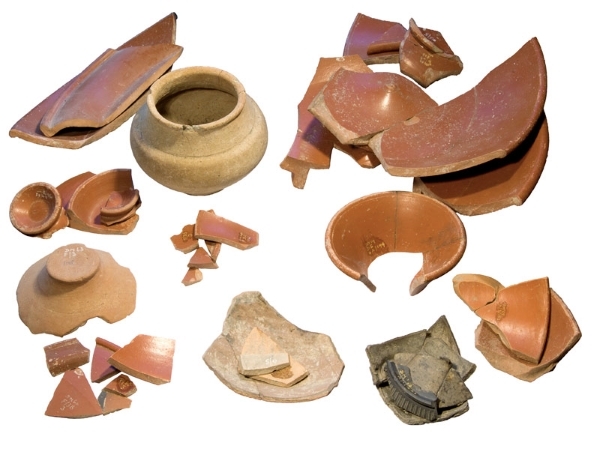 The pottery found in the pits dates from the early 1st century to the 3rd or 4th century indicating that this area had been a focus of activity by the Romans for at least 300 years. VM_ 365 Day 311 Roman millstone from a pit at Minnis Bay. After P.H.G Powell-Cotton and G. F. Pinfold, 1939. Today’s image for Day 311 of the VM_365 project shows a large Roman Millstone found on the foreshore at Minnis Bay in 1938 by a 14 year old schoolboy named James Beck. 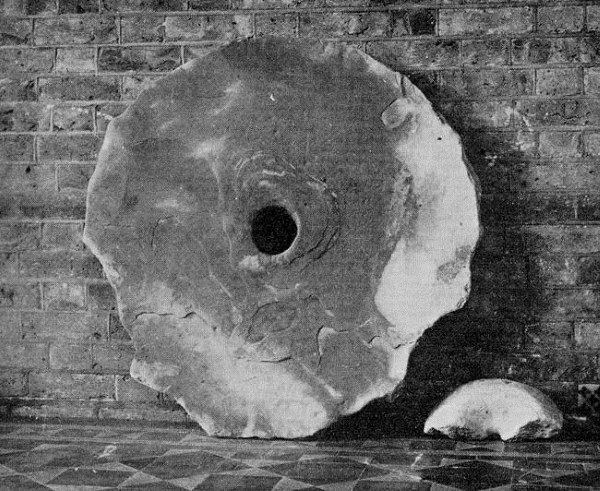 The picture of the millstone was taken at the Powell-Cotton Museum where the millstone now resides. 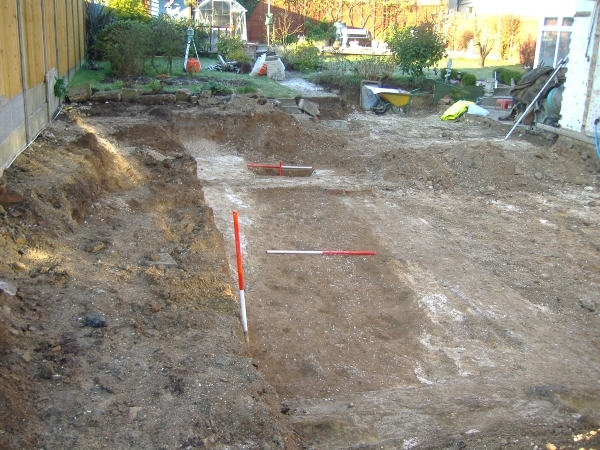 James Beck identified and excavated a group of eight pits of Roman date assisted by Antoinette Powell-Cotton. The millstone, measuring nearly a metre in diameter and almost 12 centimetres thick, was found covering one of the pits, an irregular shaped cut which measured about 73 centimetres deep. A fragment of millstone of a similar date found at Broadstairs previously featured on Day 59 of the VM_365 project. Below the millstone, the pit also contained a fine red ware vessel, two fragments of samian pottery, horses teeth and fragments of wood. James Beck also identified a Bronze Age site in the same area as the group of Roman pits and excavated and recorded a Bronze Age hoard that was previously featured on Day 202 of the VM_365 project. Today’s image for Day 303 of the VM_365 project shows a number of joining sherds from the upper part of an Iron Age polychrome decorated pottery vessel, which was found in an excavation at Dumpton Gap in the 1960’s. The image of these joining decorated sherds was digitised from a slide taken by Joe Coy, who directed excavations at the site at Dumpton. The slide is one of a small group in the same archive as the box of finds that we explored in previous posts from Day 292 to Day 301 of the VM_365 project. The post for VM_365 Day 302 looked at the monochrome surface finishes on two Iron Age sherds, one caused by natural staining, the other by deliberate application of a black carbon pigment. The vessel shown today exhibits a more complex decorative finish in a rectilinear and geometric style, similar to the Halstatt inspired scheme on the deliberately decorated sherd dating from the Early to Mid Iron Age. The pot is made of a dark grey fabric, whose surface is decorated using red Iron Oxide pigment to fill in some of the triangles and stripes that have been scored in a regular geometric pattern over the surface of the clay. The use of the red pigment to create regular rectilinear geometric decoration is similar to that of another Early to Middle Iron Age sherd from Sarre which featured on Day 198 of the VM_365 project. Another vessel from Margate, decorated with fields of red iron oxide pigment, was featured on Day 226 of the VM_365 project, although the decorative finish on that vessel is typical of the later curvilinear La Tène decorative style. Today’s image for Day 302 of the VM_365 project is of two Iron Age pottery sherds, both from a similar archaeological period and from the same site near Broadstairs. Both sherds seem to exhibit an apparent surface decoration. However, the origin of the patterns on the surface of each sherd is quite different. The sherd on the left is from the rim of a simple open-form bowl. The fabric is flint-tempered and the surface has been decorated with a comb, it is datable to between c.500-350 BC. But what are the black streaks on the surface? The sherd has been washed when it was brought from the site but the black colouring survived intact. Is this some form of avant-garde art, with the black colouring applied as a visual contrast to the more rigid but bold comb-decoration? The answer, as near as our experience can judge, is more prosaic. The pattern is caused by soot-impregnation or staining. One can imagine soot dribbles being created in a rubbish pit, where the sherd has been discarded and imperfectly sealed by earth or other rubbish. Material, wood as cuttings, carpenters shavings, perhaps even cloth or some rotting vegetable matter, is thrown on top and burnt, creating sooty ash. Then the powdery charcoal rich ash, mixed with rainwater, making a thick and rich solution that seeps lower into the pit, dribbling in streams and impregnating the surface of the pottery as it runs over it. 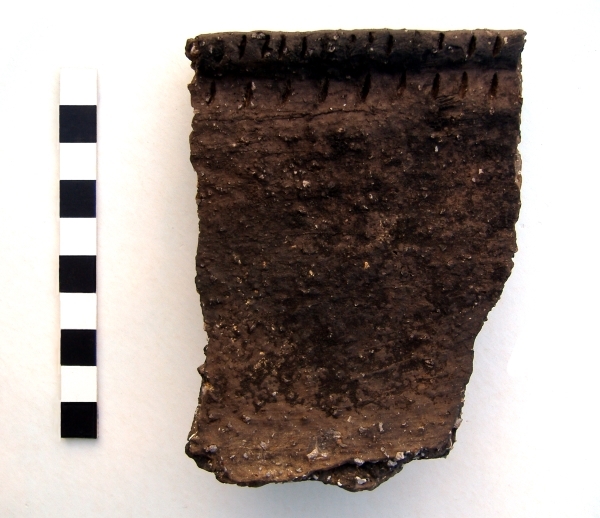 Unlike the sherd on the left, with naturally acquired soot-staining, the sherd on the right is deliberately decorated with a black trellis design, deliberately painted using crushed charcoal or carbon deposits mixed with water, to provide the black colour. The trellis pattern was applied as a horizontal band around the shoulder panel of a large fineware jar. The linear design is typical of the rectilinear motifs current during the Early-Mid Iron Age between c.600-350 BC, inspired by continental rectilinear art-forms in Halstatt style, as opposed to the more curvilinear designs of La Tene type, more typical of the succeeding Mid and Mid-Late Iron Ages between c.350-50 BC. 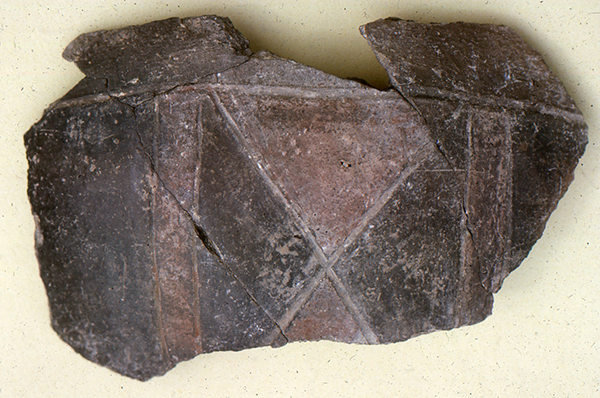 The two patterning processes, one deliberate and one a fortuitous phenomenon of the deposition of the pot sherd should cause a momentary hesitation for archaeologists before reading all patterning and surface treatments as a deliberate act of decorative symbolism. The archaeologists job is determine the boundaries between the signals from the past and the noise accumulated by the random processes of time.